Six months in the making, but today GNOME 3.20 has finally been released. And, as you’d expect from the world’s most popular free desktop experience, it’s packed full of changes. 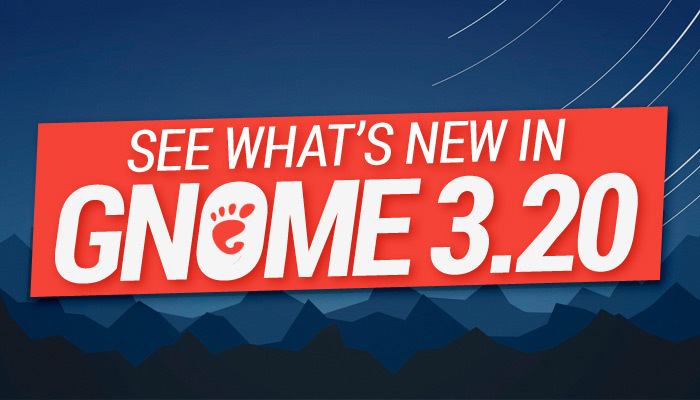 No mere bug release, GNOME 3.20 is packed with changes. 28,933 changes to be exact, including a crop of core new features, including integrated OS upgrades, improved support for the Wayland display server and a bunch more besides. Around 837 (awesome) developers helped to make this release — you may have been among them. a richly deserved pat on the back all round. The headline feature in GNOME 3.20 is Software being able to support OS upgrades. Application updates have been handled through the Software application for some time, and last release it added the ability to directly upgrade firmware (a feature that debuts on Ubuntu desktops with 16.04 LTS next month). “This is the first time that GNOME has this ability,” GNOME say of the feature. See the release notes for a full run down of the changes or check out out list of the 11 best changes in GNOME 3.20. Ubuntu 16.04 LTS is released next month but it won’t include GNOME 3.120 by default (or as an officially supported upgrade). Timing is to blame; GNOME’s latest release arrives after Ubuntu’s feature freeze deadline. Don’t reach for the OpenSUSE install disc just yet: a series of quasi-official GNOME PPAs will offer an unsupported upgrade to GNOME 3.20 for Ubuntu users running 16.04. If you don’t want to wait and have a spare USB stick to hand you can download a live image (based on OpenSUSE)that comes jam-packed with all the sweetness GNOME 3.20 has to offer — but keep in mind that this image is for testing and not installation. The upcoming release of Fedora 24 includes GNOME 3.20 by default.